Super7 Operations completely changes Lean in financial service, by focusing on customer centricity, team work, supportive management, output steering and continuous improvement. Super7 Operations was introduced within ING to radically reduce customer waiting times, with less management and more responsibility on the shop floor. Every day, the customer receives excellent service from small autonomous teams. In true cooperation, making use of each other’s strengths, they commit to getting the work done – together. 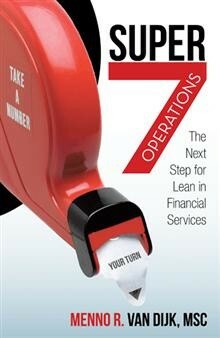 Super7 Operations takes Lean in financial services to the next level. The world of Financial Services has changed dramatically. The ‘old’ way of using Lean in Financial Service isn’t able to deliver the speed and quality that customers demand these days. Super7 Operations does that, and makes the work more interesting and challenging for the employees.